Pula, home of the 6th largest Roman amphitheatre on the planet–and now you can fly here from Split in an hour by seaplane! 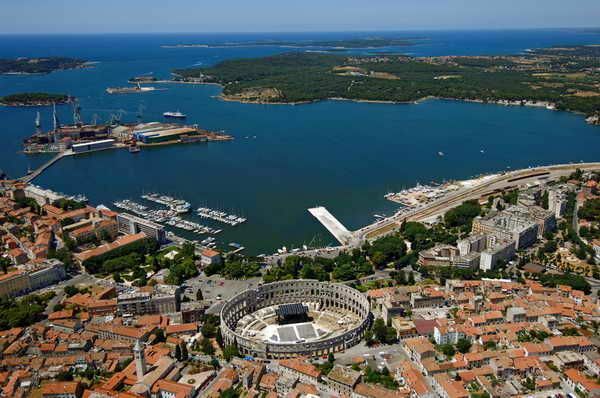 Pula is part hard-working port city (Istria’s largest, with more than 65,000 people) and part a must-see tourist attraction because of its famous 1st century Roman ruins. Smack in the middle of town, looming out of nowhere is the sixth largest Roman amphiteatre in the world and nearby a just as impressive 1st century Triumphal Arch of Sergius, which even Michangelo knew about and studied. The city has put a lot of energy into moving beyond its reputation as a working class port that also has some fabulous Roman ruins. So there are lot of nice shops, cafes and thriving art community. The ancient relics and all the Roman ruins can easily be seen in an afternoon, which is why the city and its airport serve as a first jumping off point to also explore the gorgeous villages up the coast like Rovinj and Porec. Considering its extraordinary history–remains dating back to 1 million years B.C. have been found near here and the city itself dates back to the 10th century BC—with some more effort, Pula will attract a lot more visitors. –another great official town website that’s easy on the eyes and has all the info to make the most out of your time here. –the National Tourist Board site, the go to place for what’s missing!